Thanks for joining us on a night that won't go down in Southampton folklore but will be a good memory for Jay Rodriguez. More live football text tomorrow on the BBC Sport website when Birmingham host Derby. Join us then. A couple of other results to tell you about. Athletic Bilbao, who beat Barcelona 5-1 on aggregate in the Spanish Super Cup, lost 3-2 in Slovakia tonight to Zilina. Former Manchester City youngster Robert Mak scored a hat-trick as PAOK Salonika hammered Brondby 5-0. Southampton boss Ronald Koeman on BT Sports: "We played too slowly in the first half. We played more aggressively and direct in the second half and that was the difference. "Sometimes you have to play the long ball and play for the second ball. It’s not a good result but we had five or six very good chances. "In my opinion Steven Caulker’s was a legal and normal goal. It’s never whistled in the Premier League. "We’re not really the favourites any more as they have a good result. We will fight for a win. Even a 2-2 draw would be good. "We have to learn - they are a difficult side. We have to look to ourselves and learn from tonight and do things a better way next week." Southampton defender Steven Caulker had a headed goal disallowed for a foul on a defender. He told BT Sport: "I think the goal should stand. We were a lot better in the second half. We played a lot more direct and caused them a lot of problems, I’d back us to go through. We’ve got a great team. A 1-0 or 2-0 victory would be nice." Southampton striker Jay Rodriguez scored his first goal in over a year following injury tonight. He told BT Sport: "We’re disappointed not to win. We had our chances to win the game. "I was happy to make it 1-1. It was lovely, I’ve been waiting for it. I want to score as many goals as possible so it’s good to get the first one. With our squad and our team I’m sure we’ll get the win in Denmark." Fenerbahce beat Atromitos Athens 1-0 with former Manchester United striker Robin van Persie coming off the bench to score in the 89th minute. That's his first goal for the Istanbul side. Southampton had many more shots, efforts on target and possession. But there's only one stat that matters. Fouls. No, of course it's goals. And they got one each. Not a great result for the Saints, who will now need to score in their second leg in Denmark next Thursday. Just as I have my full-time entry ready to publish, Southampton come so close to a winner - Maya Yoshida's header is tipped by keeper Johan Dahlin onto the post. Seconds to go. Doesn't look like either side is going to score a second. And he's back on now. Crisis over. Southampton striker Shane Long goes down with what looks like a knee injury, he was going down when Tim Sparv seemed to catch him. It's not looking good for the Republic of Ireland striker, especially with Euro 2016 qualifiers coming up. Corner to Midtjylland as Jose Fonte clears Paul Onuachu's cross. But it's headed clear. Plenty of time for a Saints winner. I'm not sure I remember a huge delay. Seems a lot of stoppage time. If my very quick internet research is correct Midtjylland sub Paul Onuachu is 6ft 7ins. Midtjylland make their final change as Paul Onuachu replaces Morten Rasmussen, who actually has Duncan as his name on his back (see 86 mins). Midtjylland defender Andre Romer is in no rush to take his throw-in and he's booked. Saints boss Ronald Koeman looks irritated. Midtjylland have a chance to win it as the ball bounces in the box, the Saints defenders have no idea where it is and Rilwan Hassan tries to control it. The ball breaks on the edge of the box to Morten Rasmussen but his shot is deflected. Rasmussen is known as Duncan apparently because he looks like ex-Everton and Rangers striker Ferguson. Southampton bring off England Under-21 midfielder James Ward-Prowse, who has been very good today. His set-pieces have caused lots of problems for the visitors. On in his place is Spanish summer signing striker Juanmi. The Saints are going for this now. Just less than 10 minutes to go. Southampton could really do with a goal to take the lead in this tie. Otherwise they'll need to score in Denmark. They are doing most of the attacking by this stage. Will they find their goal? Midtjylland substitute Rilwan Hassan has the ball on the edge of the Saints box and he takes an age to decide what to do, trying to take on man after man without going anywhere. He eventually loses it - ridiculous play - could have played in any number of team-mates. Midtjylland make a change in midfield as Petter Andersson comes off for ex-Arsenal youngster Kristoffer Olsson, who is still only 20. Jay Rodriguez has done his job for Southampton, scoring their goal, and he's replaced up front by Shane Long. James Ward-Prowse has a shot from 25 yards which is deflected to Saints left-back Matt Targett and his effort goes just wide. Saints dominant now - they'll be desperate for a winner as the away goal gives the Danes the edge. Graziano Pelle must lay-off about a thousand long balls each game. The ball ends up with Jay Rodriguez in the box but he slips under pressure from a marker. Tim Sparv is booked against his old club for bringing down Southampton striker Graziano Pelle. Midtjylland make the first change of the game as Rilwan Hassan comes on for Pione Sisto in the attacking midfield positions. Victor Wanyama brings the ball forward from the halfway line, plays a one-two with Graziano Pelle but then fires over from an angle when he would have been better crossing. No more Odd gags. I think I've run out, but quite the comeback from Borussia Dortmund, who trailed 3-0 at Norwegian side Odd but battled back to win 4-3. Sadio Mane tries to slip two different passes through to his strikers in a couple of minutes but neither of them come off. The Manchester United target has been involved in a lot of the Saints' moves tonight. Steaua Bucharest, it should be said, lost 3-0 at home to Rosenborg in the first leg of their tie. Southampton almost take the lead. James Ward-Prowse takes a great deep free-kick and Steven Caulker meets it with a powerful header but he's denied a great one-handed reaction save from keeper Johan Dahlin. Midtjylland aren't looking as assured as they were before the goal. They've not really done anything in the six or seven minutes since the goal. Noticeable sense of relief around St Mary's after that equalising penalty for Southampton. Not many around the press box could see much wrong with that disallowed header from Steven Caulker moments earlier. Once again, an intriguing balance to this tie as FC Midtjylland continue to look a threat coming forward while Southampton know they possess the ability to counter just as much. Sadio Mane plays a ball forward which Jay Rodriguez does brilliantly to control and play past his first defender but he can't get past his second marker to get a shot in. The Southampton striker is looking high on confidence now. Worth pointing out that Miki is Henrikh Mkhitaryan, who has been linked with several Premier League clubs including Liverpool. St Mary's is bouncing now. 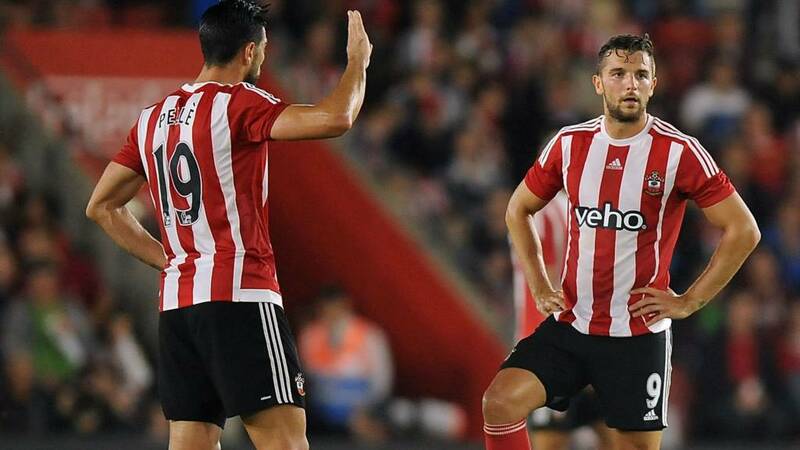 Saints are level and Jay Rodriguez has his first goal since March 2014 following a knee injury. Keeper Kian Hansen dives to his left but Rodriguez's kick is fairly central and hits the back of the net. James Ward-Prowse takes the ball past Kian Hansen, who brings him down with a swinging kick on the edge of the box. Clumsy and arguably needless. And we have an equaliser. Dortmund may at one point have trailed 3-0 to Odd in Norway but the German side have shown great tenacity to pull themselves level - Pierre-Emerick Aubameyang with the leveller, his second of the night. Dortmund have hit the woodwork three times too. Southampton looking better now and Graziano Pelle loses his marker to head Jay Rodriguez's cross but it's straight at keeper Johan Dahlin. The corner comes in and Southampton defender Steven Caulker heads home. It's ruled out for a foul on Petter Andersson although the referee didn't make it very clear for a few seconds if he was awarding the goal or not. Sadio Mane picks out Graziano Pelle on the edge of the box, the Saints striker swivels and shoots and it's deflected wide by Tim Sparv. Corner. Southampton start the half in an attacking mode but Midtjylland go up the other end and Saints just about clear a Kian Hansen throw-in with Erik Sviatchenko lining up a bicycle kick. I've seen Hansen compared to Rory Delap in the build-up to this match - not sure his throw-ins are quite as good. I said there are 190 fans supporting the Danes - I've seen plenty of Brentford fans in the away end. Apparently the Bees sold 55 tickets for this game. Brentford owner Matthew Benham is the majority shareholder for Midtjylland. Southampton get the second half under way. Doesn't look like either side have made any changes. Saints have tweeted that the attendance is 28,890, with 190 of those supporting the Danes. The goal was only Midtjylland's second shot on target. Shockwaves around St Mary's right on the stroke of half-time as FC Midtjylland take the lead through Southampton academy graduate Tim Sparv. For all Southampton's energy throughout that first 45 minutes there was a definite absence of an end product and now the Danes have punished them. You can't say they haven't deserved it for their efforts and now they have a precious away goal to show for it. Time to take the Europa League seriously? Is that the first instance of a player refusing to celebrate against an old club he never actually played a game for? That's the last action of the half. A hammer blow for Southampton. Tim Sparv scores a cracker against his old club from 25 yards but doesn't celebrate because he spent three years with the Saints academy as a kid, despite never making a first-team appearance. Saints captain Jose Fonte headed a cross straight to the Finn, who made him pay. The defender won't be happy with his contribution there. James Ward-Prowse plays a short corner to Sadio Mane, who plays the ball back to the midfielder. His cross is headed clear to Oriol Romeu, who has a good effort from 20 yards but it's saved by Pione Sisto. It's been a while since Midtjylland have done anything going forward. Sadio Mane plays a one-two with a team-mate and tries to curl the ball in from 20 yards out but he forgets the curl and it's down the middle at keeper Johan Dahlin. Southampton won't want half-time to come - they're doing all the attacking now. It was all looking pretty miserable for Borussia Dortmund after they fell 3-0 behind at Norwegian side Odd. The picture has now changed somewhat. Minutes into the second half it is 3-2, with goals from Pierre-Emerick Aubameyang and Shinji Kagawa hauling the German side back into the contest. His cross is deflected out to Victor Wanyama but the Kenyan's shot is poor and clears the crossbar. Saints are looking good now. Steaua Bucharest coach Mirel Radoi is probably not best pleased right now with his team trailing 2-0 against Rosenborg - and he can do little about it as he serves a Uefa touchline ban. Bizarrely, Romania's football federation (FRF) have announced that he can sit on the bench for domestic games - but will be banned is he gives out any instructions. He has been banned by Uefa because he does not have a coaching licence. Unlucky for Midtjylland as Petter Andersson charges into the box, he looks like he might have Jose Fonte for pace but he slips. The crowd ironically cheer, perhaps suspecting he's dived, but he just lost his footing with nobody near him. At the other end, Jay Rodriguez fires over. As far as goalless Europa League qualifiers go, this has been a good game. Southampton striker Graziano Pelle lays off a long ball forward which lands to Maya Yoshida. The Japanese defender tries a volley that would make Marco van Basten's Euro 88 classic look like a tap-in but, as you would expect, it flies horribly wide. Midtjylland work hard on corner and free-kick preparations - reportedly half their goals come from set-pieces. They have another one and there must be about eight players from both clubs surrounding Saints keeper Maarten Stekelenburg but it comes to nothing. Well it comes to another corner but that comes to nothing. Moments later Pione Sisto, probably their most lively player, shoots into the side-netting. Victor Wanyama heads James Ward-Prowse's free-kick but the ball was slightly behind him and the header goes well over. Southampton keeper Maarten Stekelenburg makes a good diving save to keep his side level, stopping a Erik Sviatchenko header. At the other end moments later Oriol Romeu has a go from 35 yards but his effort flies just over. But Pione Sisto's kick is headed clear by Graziano Pelle. A cagey opening to this one so far, but both sides displaying an intent to get the ball down and play. Oriol Romeu has looked busy in central midfield alongside Victor Wanyama and can count himself unfortunate to be in the book for what appeared a well-timed challenge at first. Pretty much a full house in the home section at St Mary's while the relatively small numbers of travelling fans are still making themselves heard. Midtjylland have a great chance here but Jakob Poulsen gets it all wrong. Morten Rasmussen is in loads of space in the centre but his team-mate waits and waits and waits to make the pass. By the time he plays it, Rasmussen is marked and the ball is overhit anyway. Southampton striker Jay Rodriguez tries to control a Graziano Pelle ball on his chest around the edge of the box and is about to swivel and shoot but the referee correctly calls it back for a handball. Southampton Oriol Romeu, making his first start since his move from Chelsea, is booked for a foul on Pione Sisto. Saints don't clear the free-kick and Petter Andersson volleys wide from the edge of the box. Robin van Persie was named on the bench for new club Fenerbahce tonight - they are playing at Atromitos Athens and that game is goalless approaching the hour mark. Plenty of the games have already finished, with Dutch side AZ Alkmaar defeated 3-2 at Romanian side Astra Giurgiu. No such problems for Ajax, who won 1-0 against FK Jablonec. Southampton have had 55% of possession so far, but it feels like more. Sounds like a decent atmosphere in St Mary's. It's all Southampton at the moment, James Ward-Prowse whips in a free-kick which centre-back Steven Caulker, a summer loan signing from QPR, heads wide. Saints on top now, Jay Rodriguez plays a good reverse ball to Sadio Mane, who shoots low but is denied by keeper Johan Dahlin. Southampton striker Jay Rodriguez latches onto a long hoof up the pitch, holds off his marker and fires just wide - the Saints' first chance. He hasn't scored since March 2014 when he suffered an awful knee injury. Sounds a big harsh to me Harry. Midtjylland's Jesper Lauridsen is the first player booked for a high tackle on James Ward-Prowse. He was going for the ball but it was a bit dangerous. Midtjylland break and Petter Andersson is about to shoot from an angle but Jose Fonte comes across to slide it out for a throw-in. Kian Hansen takes the throw which causes problems in the area but Maarten Stekelenburg is happy to see it land in his hands. Not much action to report so far. Neither side has had a long spell of possession. Handshakes going on now, well high-five slappy things. Almost ready to go at St Mary's. Maybe for the big clubs they like to play Champions League and they don’t like the Europa League, but for us, for everybody, for the players, for the fans, it’s a new situation and it’s a good feeling. Um, look away now Dortmund fans. It's 3-0 to Odd. We know a bit more about them because in Denmark everybody follows the Premier League, so hopefully that will give us a good result. We don’t know a lot about them but we’re going to make sure we’re focused. We’re professional and we’ll do our jobs right. Borussia Dortmund are losing to Norway's Odd within 13 seconds. Since Matthew Benham invested £6.2m in FC Midtjylland last July, the club from the Jutland peninsula of Denmark have won their first Superliga title and currently sit top of the division this season after four wins from their first five games. One their most notable academy exports is West Ham defender Winston Reid. Another name to look out for this evening is Sudanese-born midfielder Pione Sisto. The Denmark international is currently attracting interest from a number of clubs around Europe. FC Midtjylland, whose majority shareholder is Brentford owner Matthew Benham, have a sort-of moneyball approach to football. Since coming in last summer, he has brought in "specialist kicking coaches, in-game statistics for half-time team talks and the use of analytics for set pieces," according to a great feature in the Guardian over the summer. I've just scoured through the Uefa rules and it looks like he will be able to play as qualifiers don't make you ineligible. Should Prem teams take Europa League seriously? Mark Critchley: Yes, as it's a serious competition. There's a trophy at stake, something to add to the cabinet & they could play in Europe the following season (and even in the Champions League if they win it). It's always frustrating when you realise that teams do not take the competition that seriously. They should be thankful to have a place in the tournament. Adam Sweeney: If their squads big enough yes. Shame most clubs care more about the premiership money than European success. Andrew Bucknall: Why not? If they try all season to qualify for Europe and then complain or play weakened teams, they should give up their place and let someone else take it!! Same as domestic cup competitions! If they are seen as a hindrance, opt out like some big club once did with the FA Cup! Manchester City were mocked for trying to win all four competitions we were in! Why? Let us know what you think using the BBC Sport MOTD Facebook page. No easy games in Europe? I don’t know much about them but they are a good side because to be in Europe you have to be a good team. I'm guessing Victor didn't watch San Marino side Juvenes/Dogana lose 11-0 on aggregate to Brondby in the first qualifying round. Or Lithuanians Kruoja losing 9-0 to Jagielloni over two legs? The problem sometimes with playing in Europe is you don’t really have good long sessions to train what you need to improve. Last season, every Friday we did unit training, but now the Friday is the day to recover. Then we have to learn about it by showing clips and meetings and not on the pitch. That’s the difference and maybe one of the reasons that we need time. Sadio Mane told a young Southampton fan on his way into the ground that he will stay with the Saints. Southampton - who have sold enough quality players to make a good Premier League side in the past two years - now face a battle to hold onto forward Sadio Mane. Manchester United are interested in the 23-year-old Senegal international. Mane scored 10 goals in 32 appearances last season after joining for £10m from Red Bull Salzburg, including the fastest ever Premier League hat-trick. FC Midtjylland midfielder Tim Sparv spent three years with Southampton's academy but never made a first-team appearance. The 28-year-old Finland international said: "It’s a little bit surreal. I actually met some friends at the hotel. “I definitely have fond memories of my time here. The academy set-up was incredible, everyone was really ambitious - new thinking, a modern approach. It was a great education that I got during my youth years. “From an outside perspective I feel it’s a real model club from the way they conduct themselves, the youth players that they bring through. The football philosophy they have under Ronald Koeman is also very attractive." Southampton: Stekelenburg, Caulker, Fonte, Yoshida, Targett, Wanyama, Romeu, Ward-Prowse, Mane, Rodriguez, Pelle. Subs: K Davis, Cedric, Long, S Davis, Tadic, Martina, Juanmi. Midtjylland: Dahlin, Romer, Hansen, Sviatchenko, Lauridsen, Sisto, Poulsen, Sparv, Royer, Andersson, Rasmussen. Subs: Pusic, Urena, Olsson, Banggaard Jensen, Andersen, Onuachu, Hassan. If you live in the BBC Solent area, you can listen to commentary of this game on a radio. Unfortunately it's not available online for rights reasons. If FC Midtjylland were a human, they wouldn't be old enough to drink alcohol yet. The club was formed in 1999 following the mergers of Ikast FS and Herning Fremad. They were promoted to the top flight at the first attempt and won the league last season. Unfortunately for them they lost to Apoel Nicosia in the Champions League qualifiers, which is why they are now in the Europa League. Geography fans might be interested to know that Midtjylland isn't a town, but one of the five regions of Denmark, where the club is based. There are some big clubs playing tonight in the other qualifiers. Ajax are at home to Czech side Jablonec while Borussia Dortmund are away to Norwegian club Odd. Barcelona's Spanish Super Cup conquerors Athletic Bilbao are at Slovaks Zilina. Robin van Persie and Nani's new club Fenerbahce are at Atromitos Athens. With the Europa League winners getting a Champions League berth, is it worth teams like Southampton going all out to win this tournament? The Saints are more likely to win the Europa League than finish fourth in the Premier League, I'd have thought. With that in mind, should West Ham have fielded a proper side in the qualifiers? Let us know your thoughts on all things Europa League related using #bbcfootball on Twitter, 81111 on text (UK only, let us know your name) or on the BBC Sport and Match of the Day Facebook pages. Southampton make four changes from the side which lost 3-0 at home against Everton in the Premier League on Saturday. Manchester United target Sadio Mane starts as expected. New signing Oriol Romeu is handed a full debut following his substitute appearance against the Toffees. Elsewhere, Steven Caulker takes his place in defence, James Ward-Prowse comes in to midfield and Jay Rodriguez starts upfront. Out go Shane Long, Steven Davis, Cedric Soares and Dusan Tadic. West Ham, Aberdeen, Inverness, St Johnstone, Glenavon, Glentoran, Linfield, Bala, Airbus and Newtown have all tried and failed. Can Southampton succeed where their 10 British comrades didn't and reach the Europa League group stages through the qualifiers? Tonight we will go 50% of the way to finding out.